I created a handy little plugin that separates RGB channels in a layer, without having it to do separately for every channel. As it is a Pixel Bender script, it can be used both in Mac OS X and Windows. I don’t know if such a plugin exists or not, but this is designed to work specifically with After Effects and might not work properly in Flash or Photoshop. It is compatible with Adobe After Effects CS4 only, just copy the plugin to your plugins folder. Also, if you encounter any problems or if you have any questions please post them in the comments. Update: The plugin automatically detects the Comp Size, but I left the parameter to change the Comp Size if needed! For text layers you can apply the effect directly. 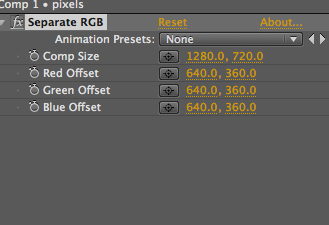 But for images and videos which are less than the Comp size, you have to Pre-Compose the layer into Comp Size. Update: You no longer need to Pre-Compose an image. You can split the channels directly by applying the effect on the image. Thank you Daniel Wilk. Version 2 includes, scaling, rotation, and fading support. This plugin can be downloaded from Aescripts.com and the donation there is optional.